Are you interested in finding out more about what the British Club Hamburg does ? Then take a look at the reviews below. These are just some of the many events which we organize for our members. Whether social, cultural, sporting or culinary activities, the British Club Hamburg offers something for everyone, as well as the opportunity to enjoy British traditions such as Guy Fawkes, Christmas Lunch or a Pub Quiz. The Sunset Billard Bar Bistro is an unconventional pub located between Wandsbek and Dulsberg. 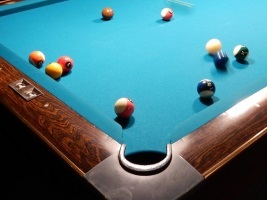 Apart from dart and board-games it also offers pool billiard. We played doubles and enjoyed the cosy atmosphere and had a few drinks, which thank to “Ladies Night = 50% discount” were a real bargain for our ladies. On top of that the British Club Hamburg invited its members to a “Homemade-Pizza-Snack”-yummy. Once again the Hamburg Players excelled themselves with a first rate performance of this stylish whodunnit set in London in 1937. The set and the costumes were excellent and, not only were we entertained with some first class acting, but before each act, we were serenaded with a song from the era, setting the atmosphere for the ensuing drama perfectly. 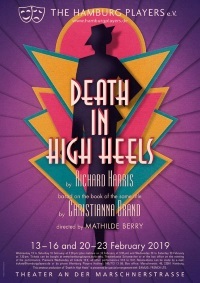 The plot was entertaining and witty and this was amateur dramatics at its very best, reflected in the resounding applause and numerous curtain calls taken by the cast. English Theatre of Hamburg watch out, you have some serious competition here! It seemed no time at all since the Christmas Lunch when the Grünkohl fans, plus three philistines who are not so enthusiastic consumers of this winter vegetable, met up at Blankenese Sailing Club to indulge in this traditional seasonal fare of green cabbage, sausages and gammon, served with fried potatoes. With such a hearty meal the schnapps provided at the end was welcome! 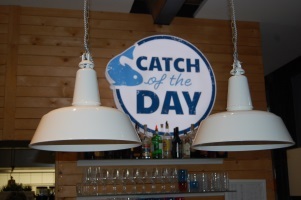 The three ‘philistines’ enjoyed panfish served with salad and a mustard sauce. A convivial few hours were spent catching up with fellow BCH members, the buzz of English chatter and laughter filling the room, and everyone took their leave replete and happy. Sunday, 9 December turned out to be a wet and windy day, but nothing could dampen our spirits as we travelled to the Catch of the Day restaurant in the HafenCity’s Maritimes Museum. And we weren’t disappointed with the new venue! On arrival we were greeted with sherry and mince pies and had the opportunity to chat with other members and guests. Following this we moved to festively decorated tables with place settings which included a Christmas cracker, gift and BCH tote bag. The friendly staff quickly got our drinks sorted out and then the food was served. The three-course, sit-down lunch made a nice change to the buffets of previous years. My personal favourite was the starter, smoked salmon with blini pancakes. We all agreed that the main course of turkey with potatoes, vegetables and gravy was a good first attempt at a traditional British Christmas lunch, while the brandy sauce served with the Christmas pudding was actually warm! Those of us who prefer something lighter for dessert enjoyed the cheesecake alternative. Time flew by and before we knew where we were, it was time for the next item on the programme: a short Christmas carol concert by the Hamburg Players choir. They turned out to be excellent singers and certainly got us into the festive mood, as was apparent by the number of people who joined in the sing-along at the end. The afternoon wound up with our traditional “Secret Santa Lucky Dip” before everyone set off for home – maybe a little full; maybe a little tired but certainly happy. Five members of the British Club travelled to Lübeck to see the Christmas markets. We were fortunate because although it was quite cold we had plenty of sunshine. We were really impressed by the Kunsthandwerkermarkt in the Heiligen-Geist Hospital, one of the best I personally have ever seen. Thanks to E.B., who knows the city like the back of her hand, we were also able to take a peek at the Schiffergesellschaft and the Thomas and Heinrich Mann Museum. We also paid a quick call at the Niederegger marzipan shop which has an incredible assortment at this time of the year. Lübeck calls itself the “Weihnachtsstadt des Nordens” and rightly so. There is much variety including a medieval market and the fairytale forest. Definitely worth a visit at this time of the year! The ice skating night at the “EISARENA” (Planten un Blomen) is a must-see for everybody who has a liking for ice-skating and music. The DJ served for every taste of music from the 80ties up to now. We admired artist “flying” over the ice and others who imitated Michael Jackson’s “Billi Jean” on ice and saw funny creature as well (not from “Thriller”). During the break the we had a cup of hot “EILLES” tea offered by the club while we were watching the spectacle and enjoy-ing the view to the DOM. After a welcome drink of Sekt, provided by the BCH, we entered the private room at Hotel Alte Wache to sit at the table imposingly decorated with beautiful silver candelabra. K.H.F. gave an interesting speech illuminating why this traditional meal is called Martins Gans and takes place around the 11th of November. He explained that this is in fact a celebration of the life and work of St Martin, a Roman who became a catholic bishop renowned for his charitable and humble demeanour and gave us a charming insight into his life and good works. There followed a delicious meal of not only goose with all the accompaniments, but a large choice of soups to start with. I chose the pumpkin soup which was very tasty. However, when the main course was in full swing, I wished I had forgone the starter, as a wonderful plate of goose with baked apple and dumplings was placed before me, closely followed by bowl after bowl of potatoes, red cabbage, brussels sprouts and gravy. The goose was plentiful, provided with silver service from large platters which were brought round again and again until I had to admit defeat! To my shame I have to admit to giving into the tempting dessert of speculatius parfait with fruit. After all that lovely food and a companiable few hours catching up with club members, what was left but to return home and retire to the sofa to digest both the food and the events of the afternoon. 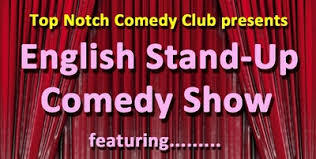 In November the Top Notch Comedy Club presented two comedians with an “alternative” take on Western life. Eshaan Akbar had us all laughing as he recounted his experiences as a bearded, brown-skinned man with a backpack on the Tube, but also made us re-think how we view European-born Muslims. Joe Jacobs told us about his experiences as a Jewish son, interspersing his set with grime rap numbers. I’m not sure that we as the audience reacted as positively as Joe had hoped, but it certainly wasn’t a run-of-the-mill evening. It was the first day of wintertime, chilly and sunny, and we all managed to arrive on time at the Savoy Cinema. After a free glass of champagne, we relaxed in our very comfortable seats…. feet up on the footrest… not knowing what exactly to expect. 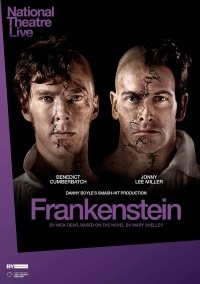 Frankenstein, of course, but what a performance! We were spellbound by the Creature’s (Benedict Cumberbatch) very acrobatic way of learning how to walk, and the thrilling production drew us into questions around science and humanity. What better to do after an interesting theatre performance than sit together, chat and have something to eat? And this is exactly what we did! Are you interested in becoming a member ? Then send us an email (use this link).